With up to 3 MBytes/s download speed to RAM and record-breaking flashloaders, as well as the ability to set an unlimited number of breakpointsin flash memory of MCUs, the J-Link debug probes are undoubtedly the best choice to optimize your debugging and flash programming experience. J-Link debug probes support ARM 7/9/11, Cortex-M/R/A, Microchip PIC32, Renesas RX CPUs as well as SPI flash devices. Here is the complete list of microcontrollers and SPI flash devices that are supported by J-Link. 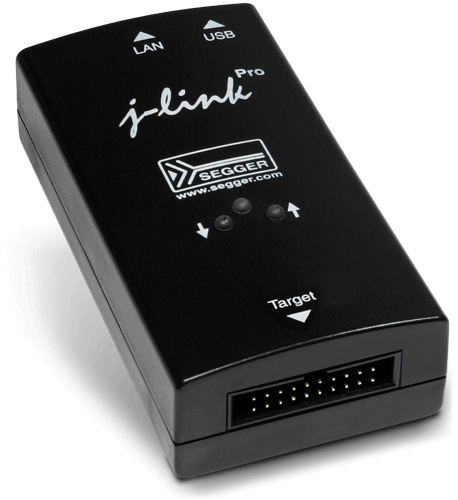 The J-Link debug probes are supported by all major IDEs including Eclipse, GDB-based IDEs and SEGGER Embedded Studio. For a complete list, please refer to Supported IDEs. J-Link comes with built-in virtual COM port (VCOM) functionality. This means that in addition to the regular J-Link debug functionality, J-Link will also show up as a COM port in the device manager of the operating system. As most modern computers do not expose a physical COM port anymore but many hardware setups still use UARTs for logging, diagnostics and application control, usually a separate COM to USB adapter is needed to use the COM functionality of the target hardware while debugging in parallel. With J-Link, such an additional adapter is not required as J-Link provides this adaption functionality.